Remaining the preferred choice of touring artists and recording professionals worldwide, the SansAmp PSA-1 provides the widest range of amplifier, harmonic generation, cabinet simulation, and equalization tone shaping options available. 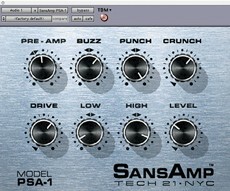 You've heard SansAmp on literally thousands of recordings, used on everything from drums and bass to vocals and harmonica. Requires an iLok™ USB Smart Key for authorization (sold separately).